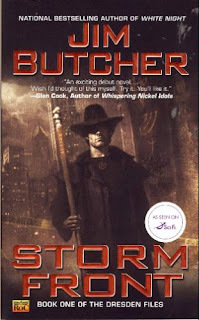 Lord of the Night reviews Storm Front, first book of the Dresden Files, by Jim Butcher. The very first book of the urban fantasy Dresden Files series is my latest finished book, and it was worth every penny. Only two days to finish this book, and thats not a comment on length, its a comment on quality. I couldn’t put it down. Harry Dresden is Chicago’s only professional wizard, and he’s in the yellow pages too, under Wizards… a lot of are you serious calls are inevitable but every so often Harry gets a serious job, which along with his consulting job for the Chicago police just barely pays his rent a month late. But when a murder takes place and magic is the only suspect Harry is pulled into a conspiracy with the police, mobsters, a vampire and a mysterious Shadowman who seeks Harry’s violent death. Not only must he stay alive but in addition to dodging death he has to find a missing husband, avoid his council-appointed watchdog with a grudge, and be prepared to defend his very life before the White Council in only two days time. Butcher has created quite a cast for the first novel. The protagonist Harry Blackstone Copperfield Dresden is the only professional wizard currently publicly active, not to say there aren’t more but Harry is the only one who goes public with his powers, and is quite well-written. Wisecracking at times yet serious when he needs to be, Harry is a well-rounded character who is very easy to like. Other main characters include Mister, a cat that dwarfs some dogs and likely considers himself Harry’s owner and isn’t thrilled about it. “Bob”, an air spirit of intellect who resides in Harry’s basement and within a skull, “Bob” provides information from his vast stores of knowledge to Harry but unfortunately is completely aware of his own value and never takes Dresden’s threats to dump him down a well seriously. And police lieutenant Karrin Murphy who runs the Special Investigations department of the Chicago Police, Murphy is semi-aware of the magical world and though she has a like-hate relationship with Harry she does show that she is his friend and is willing to help him, to a point. The action scenes in the novel are quite interesting. Harry’s command of magic is brutish and focuses more on sheer power than refinement, thus large firebolts and wind storms are no problem for Harry, no more so then others, but Harry is also a decent shot and carries a .38 revolver in his trademark duster for situations when magic is overkill. He is also a good brawler and with his tall height and physical prowess can overpower opponents, which helps a lot since most expect wizards to rely on magic and magic alone. The pacing is quite good and at no point did I feel rushed or slowed, rather the book always had my attention with something good, be it action scenes or some very funny moments with Harry and “Bob”. The novel ends with Harry explaining his world view and what he would like to make happen, and reminding the reader that if they ever need help, he’s in the book. I give Storm Front an 8/10, its a great start to the series and I thoroughly enjoyed it, its a nice break from 40k and Fantasy which although are great I can’t read about them book after book after book. Now onto Fool Moon, the second Dresden Files book. Should you buy this book?, if your a fan of magic and detective stories then yeah I would advise buying it. 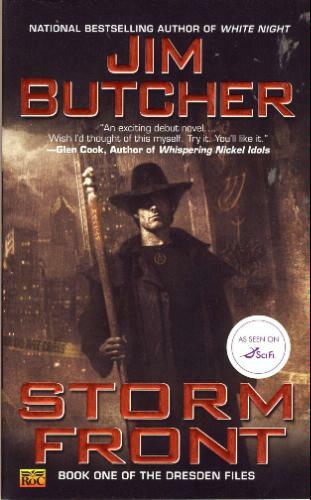 Its a good book and hopefully a prelude to greater novels to come in the Dresden Files series.